This year, PEN Melbourne’s annual International Women’s Day event features a conversation with the bestselling author Alice Pung, the celebrated author of Her Father’s Daughter and Unpolished Gem, and editor of the anthology Growing Up Asian in Australia. Join us for another great discussion including snacks and crafts that fit the theme of the book! Read the book as a family before the meeting; copies of the book are available at the front desk. Cornelia Funke promotes Reckless. Carn de pedra. Roswitha Hintze reads from Tiergeschichten von Cornelia Funke. ; Cornelia Funke, Leselöwen Tiergeschichten. Cornelia Funke was born in 1958 in the town of Dorsten in Westphalia, Germany to Karl-Heinz and Helmi Funke. As a child, she wanted to become an astronaut and/or a pilot, but then decided to study pedagogy at the University of Hamburg. After finishing her studies, Funke worked for three years as a social worker. During her social work she focused on working with children who came from deprived backgrounds. She had a stint illustrating books, but soon began writing her own stories, inspired by the sorts of stories that had appealed to the deprived children she had worked with. During the late 1980s and the 1990s, Funke established herself in Germany with two children's series, namely the fantasy-oriented Gespensterjäger (Ghosthunters) and the Wilde Hühner (Wild Chicks) line of books. Funke has been called "the J. K. Rowling" of Germany; although she was highly successful in Germany, the first of her books to be translated into English was Herr der Diebe in 2002. It was subsequently released as The Thief Lord by Scholastic and made it to the number 2 spot on The New York Times Best Seller list. The fantasy novel Dragon Rider (2004) stayed on the New York Times Best Seller list for 78 weeks. Following the success of The Thief Lord and Dragon Rider, her next novel was Inkheart (2003), which won the 2004 BookSense Book of the Year Children's Literature award. Inkheart was the first part of a trilogy which was continued with Inkspell (2005), which won Funke her second BookSense Book of the Year Children's Literature award (2006). The trilogy was concluded in Inkdeath (published in Germany in 2007, English version Spring 2008, American version Fall 2008). 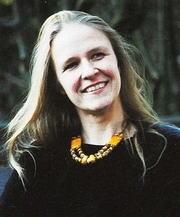 Cornelia Funke is currently considered a "single author." If one or more works are by a distinct, homonymous authors, go ahead and split the author. Cornelia Funke is composed of 28 names. You can examine and separate out names.